Back when I took off on my first round-the-world trip in the early 1990s, the two of us had a budget that averaged out to $15 a day. For two. That meant our lodging was often between $4 and $7 a night. Sometimes more, sometimes less depending on the country, but we managed to make it work over the long haul. Here we are almost 25 years later and it’s hard to find a $5 room anymore. 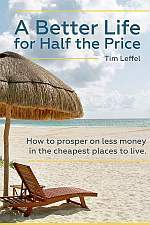 It can still be done in some spots like India, but the new cheapie standard has risen with inflation and increased tourism. After all, $5 in 1994 is equivalent to $8.36 in 2018 dollars. When I visited Thailand back then, the country received around 6 million annual visitors. Now it receives more than 30 million. That kind of growth has a tendency to drive up prices. There are still plenty of places around the world though where you can find a hostel bed or even a private room for cheap. Here are a few on different continents to give you an idea. India has plenty of luxury palaces to stay in, but it also still has the most cheapo places to stay of any country around. That’s especially true if you get off the main tourist track where the short-term vacations are going. From Manali to the southern beaches, you can frequently find double rooms for less than $10 still. This place to the right in Kovalum is listed on Booking.com for $9 a night. Nepal just might be the cheapest country on the planet for budget travelers. Even if you pull up a booking site like Agoda, you’re going to find crazy cheap prices on hotels. I found a double room with private bath in Pokhara for $6 and a hostel bed for $3. A gorgeous place with a pool is often $15 or less. See my rundown here on travel prices in Nepal. The country of Vietnam offers some of the best values in the world on lodging at every level. The whole first page of Trivago for Ho Chi Minh City is $11 or less per night double, some of them including breakfast. Plus here you’ll often get things you’ve missed in other parts of Southeast Asia at the cheapies, like maid service and towels. Search prices here. One of the cheapest places to live in the world is also one of the cheapest travel destinations. As with Vietnam, the cheap places in Cambodia are pretty nice, while if you splurge an extra $5 you can end up with a terrific deal. In a country where a 5-star hotel can be under $100 at times, you can find a 2-star place for under $10 or get a dorm bed at the “Siem Reap Chilled Backpacker” hostel with a pool for $3 a night. (Snag a $10 private room there and they’ll pick you up at the airport for free.) Search Siem Reap hotel prices here. On Agoda you can find similar deals for Bukkatingi. Last time I was on Ometepe Island in Nicaragua, I just rolled off the ferry and started looking around for a room. I found a single with air conditioning and hot shower for $7. I just pulled up the island on Trivago and ended up on this place below. Not fancy but it’ll do. Even for something you reserve in advance, $12 double or $10 single. A dorm bed is $6. I also found places for around the same price in Rivas, Matagalpa, and Estili. In Leon there was one hostel at $6 a night and one for $9 a night with breakfast. The cheapest country in South America hits you up for a reciprocal visa fee when you enter, but after that it’s a bargain. I enjoyed my time in Sucre best and if you head there you can stay in Casa Blanca pictured at the top of this post for $7.20 a night in a dorm—-including breakfast. Or get a double room at other places for $15. You may think it’s impossible to find a cheap hotel room in Europe, but I found plenty of bargains in the Balkans last year, even though I was there during summer. In Bosnia, there are some dorm beds as low as $7 a night and decent double rooms for $15 or less. I paid $18 a night in Mostar, but this snagged a nice room with a balcony and a kitchen for $14 a night in Ulcinj, Montenegro. (See more on travel prices in Montenegro here.) As with some other countries on this list, you may have better luck looking around after arrival than just searching online, especially in rural areas. If you surf around the Bulgaria listings on Booking.com, you’ll find plenty around that $15 a night double mark, from Plovdiv to Smolyan to the Black Sea coast. In the summer months you can do multi-day hiking trips and stay in mountain huts. Just be advised the conditions vary greatly and you might need to bring supplies with you. Get more info at this hiking site. There are ways to stay somewhere for even less when you travel. You can carry a tent and camp. You can travel by dirtbag van. There are also ways to stay in a real house or apartment for free, however, that don’t require anything more than your backpack. The old-school way of crashing with random strangers still works, for those who don’t mind being assertive and living with uncertainty. But to me this often comes off as a little sleazy, especially if you’re a privileged Brit, American, or Canadian crashing with a family that is scraping by on $400 a month. Are you really doing this for a cultural exchange or are you doing it because you didn’t save enough money? Or aren’t willing to work to pay for your travels? Although you don’t hear much about it anymore, Couchsurfing is still a thing. The organization is a shell of what it once was when it was an organization instead of a corporation, but there are still 400,000 hosts around the world and the website still gets a huge amount of traffic. There’s a free tier, but they try to get you to pay a verification fee so you can send unlimited requests and get a little checkmark by your name. How much is that fee? You’ve got me—it’s not listed anywhere on their public site. They have meet-up events and single travelers especially like it because they get a locals’ insight into the city and meet new people. There are a few other homestay operations around, including the original cultural exchange one Servas, but none has near as many members as Couchsurfing. I know a whole lot of digital nomads who stay in one place for a week or months as a housesitter. This works especially well if your schedule is flexible and you like taking care of pets. It’s going to cost you $119 to join, but then you could be staying in a beach house or chateaux that would normally be well beyond your means. See TrustedHousesitters for info and membership fees. Even in the US and Canada thrifty lodging is possible. An example is the Evergreen Club which is a network of folks 50 and over that offer lodging and a simple breakfast for $15 a night for singles and $20 a night for couples. This article sure brings back a lot of good memories — like when rooms in hotels in S America could be had for just $1! . Today, with the sharing economy, even Airbnb and its wannabe Bed y Casa can offer good value on occasion. Thanks, Dorothy, for your tip for seniors. Couchsurfing has special groups for 50+ and 60+ members that can be helpful. Great info as always. Yes, too bad couchsurfing sold out. It used too be a real cool site until they hooked up with fb.